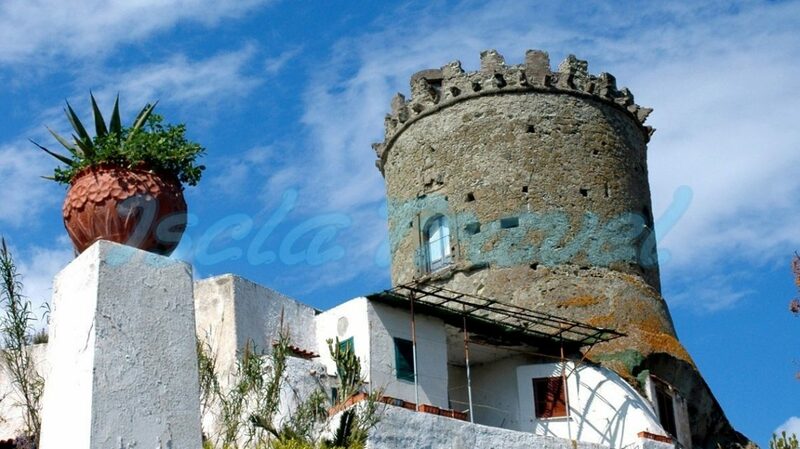 Torrione is the largest and oldest tower in Forio, built in 1480 as a tower of sighting and defense of the territory, to face pirates incursions. This important structure was raised on a tufa-shaped rock in a strategic position to control the harbor from above. The circular shape provided a complete vision and was the most suitable for the angle of the guns. the tower was equipped with four bronze cannons, that, once the danger of the pirates’ incursions was over, were used to fire in the holiday period; this custom lasted until 1788., There was a watcher called the torriere for the Torrione monitoring who had the task to warn ones he sees an enemy ship and to command the garrison on the first floor. The lower floor was used as a stock for food and artillery; there was also a small tank for rainwater collecting. In the same period another seven towers were built in Forio, not only circular shaped but also square shaped. These towers were built by the people of Ischia island, especially in the 16th century, when the attacks of the pirates increased (a disastrous one by Ariadeno Barbarossa of 1544, followed by the raids of Dragut and other corsairs), to form an effective and uninterrupted system of fortifications on the territory. In 1900 the Torrione Tower was used as a museum to host a collection of works of the famous local artist Giovanni Maltese, who at the end of the eighteenth century received a building in leasing from the Commune of Forio and he transformed it to his home and office. Nowadays, after the works carried out in the 1980s, the lower hall places the Civic Museum of the Torrione and it is used for temporary exhibitions. The upper hall houses the Giovanni Maltese Civic Museum, where the sculptures and the paintings left by the artist’s wife to the municipality are exhibited. Do you want to visit "Torrione Museum"?